Happy happy Monday my friends! I hope you all are having a wonderful, productive day. Our spirits are lifted here in the South now that the weather has become warm again. Living in Arkansas, you just never know what you may get with our crazy weather. We tend to experience four seasons all in one week – but the last several days, we have had beautiful, glorious, sunshiny spring! 🙂 Gorgeous weather just makes this Mama so happy! 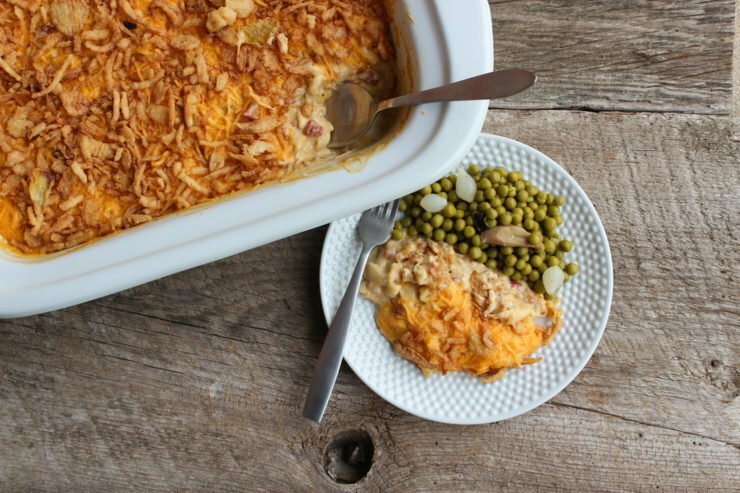 Something else that makes this Mama happy is this Slow Cooker Creamy Chicken Macaroni Casserole. 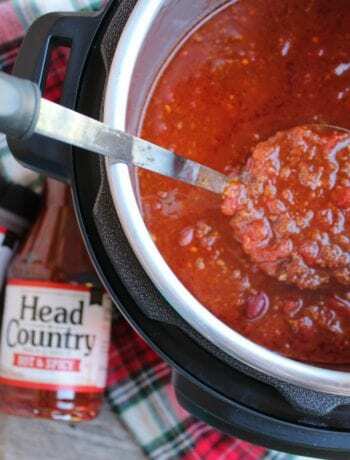 Long name, big flavor, and simple instructions! My kind of recipe! 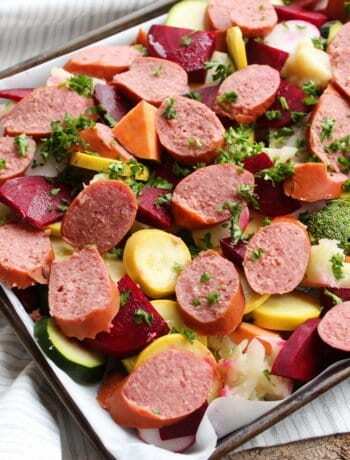 🙂 Fast and easy recipes are always a must around our house but it’s extra nice to come home to a hot meal ready to go in the slow cooker on a busy Monday evening! 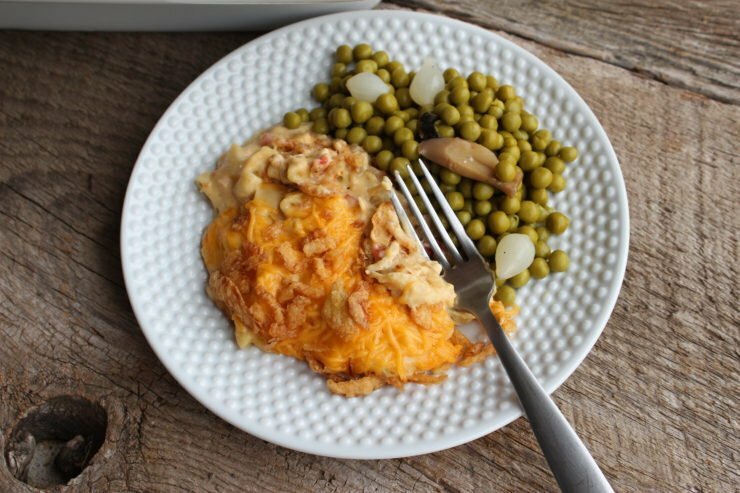 This Slow Cooker Creamy Chicken Macaroni Casserole reminds me of a recipe my mom always made when I was a kid. There is something so comforting about coming home to the house smelling of melted cheese, tender chicken, and creamy macaroni. I remember coming home from school one day as my mom was just pulling dinner out of the oven. As I walked into the house and threw my backpack on the couch, the smells of cheesy chicken and noodles wafted my way from the warm kitchen. The refreshing coolness of the air conditioner mixed with the warmth of the slightly humid kitchen and the smells of cooking food was about the best thing a tired child could come home to after a busy day of trying to learn algebra and proper sentence structure. Shortly after the school bus brought me home, Dad came in and we all sat down at the kitchen bar to eat dinner. For some reason, we never sat at the kitchen table. We always ate dinner together as a family but the table was only reserved for special occasions or holidays. Mom sat at the end of the bar with me to her left and then Dad to my left. She always placed the food in front of us on the bar and then served us from the other side of the bar before taking her own plate and serving herself. Every meal was accompanied with iced, sweet tea and usually a large, fresh, green salad. 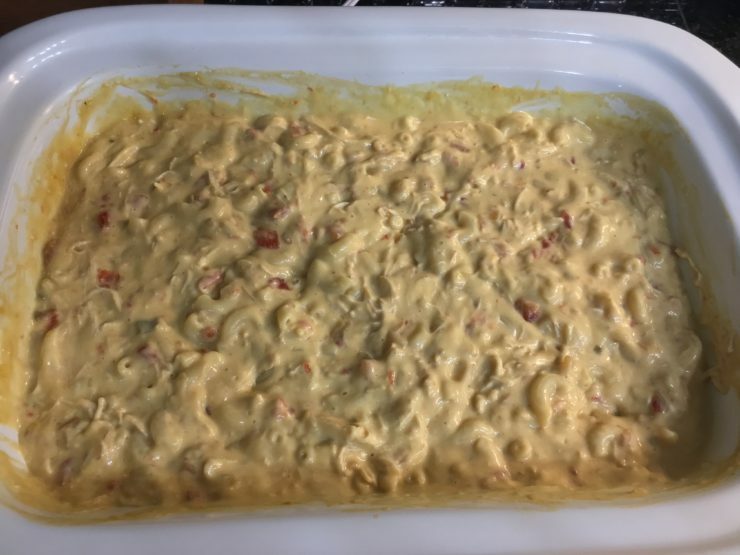 I’ve changed my Mom’s recipe up to create a new spin on her casserole, maybe one of these days I’ll post the original recipe that inspired this Slow Cooker Creamy Chicken Macaroni Casserole which is just as delicious, just not as bold in the flavors. Today I’ll be sharing with you my recipe for this Slow Cooker Creamy Chicken Macaroni Casserole. I like to start out by grabbing the ingredients I need right away. 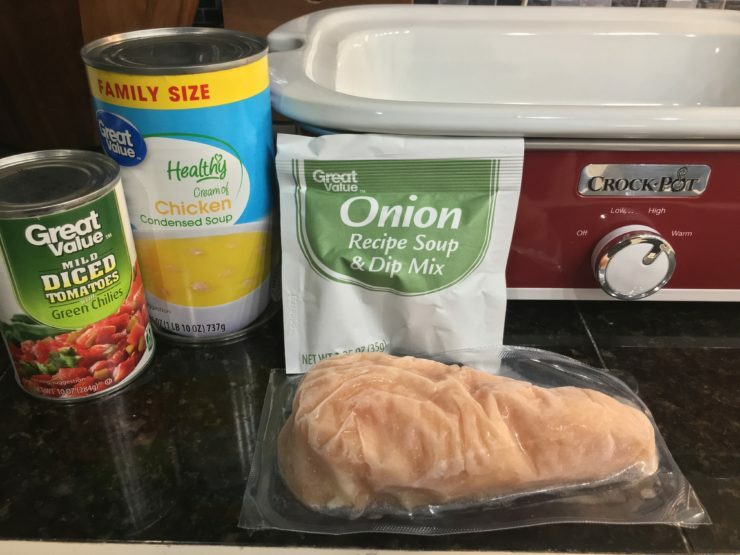 Here I have my 15oz can of mild diced tomatoes with green chilies (mild because my husband can’t handle much heat but feel free to make this as spicy as you like), a family sized can of Healthy Cream of Chicken Condensed Soup, one packet of Onion Soup & Dip Mix, and one (yep, you read right, just one!) frozen, boneless skinless chicken breast. 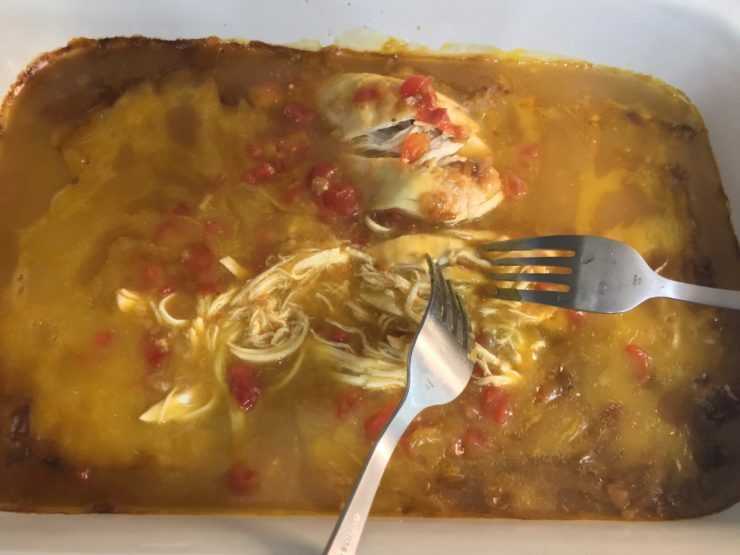 I used my casserole sized (9×13) Crockpot slow cooker for this recipe but any slow cooker 4 quarts or larger can be used. Let’s start out by removing the chicken from the packaging and placing it in the slow cooker. I placed mine straight in, still frozen. 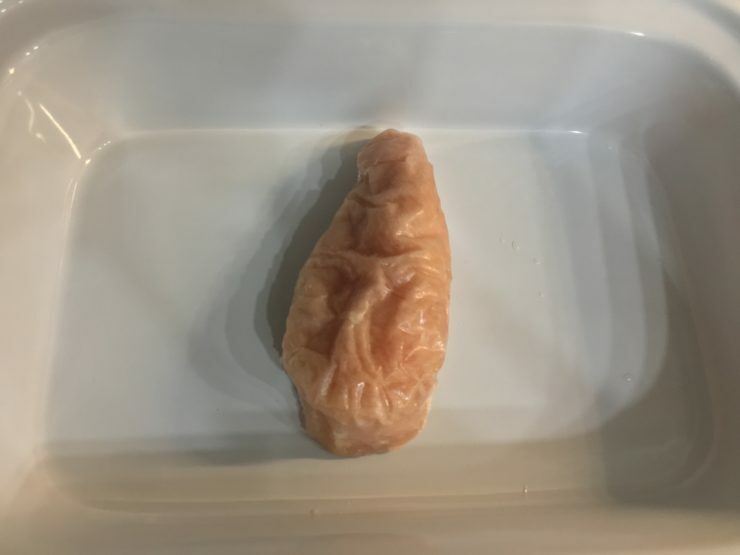 This was a large chicken breast so I only used one, but if you have a very small chicken breast, you might want to use two. 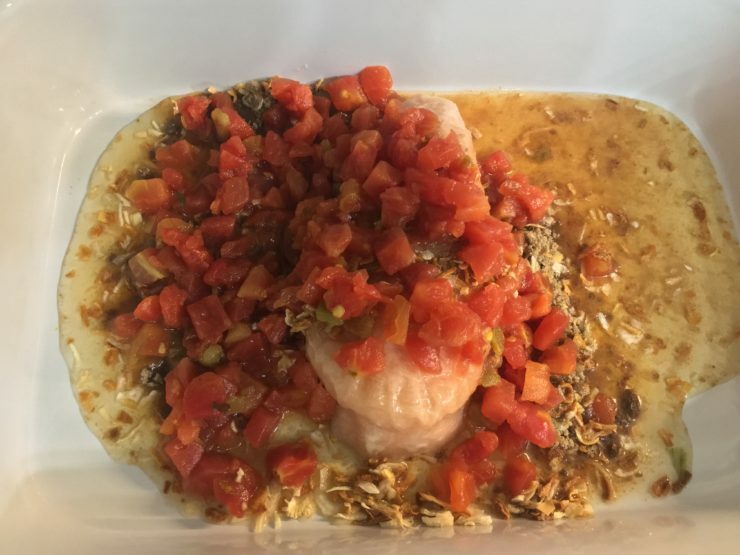 Two boneless skinless chicken thighs can also be used for this recipe as well if you prefer. 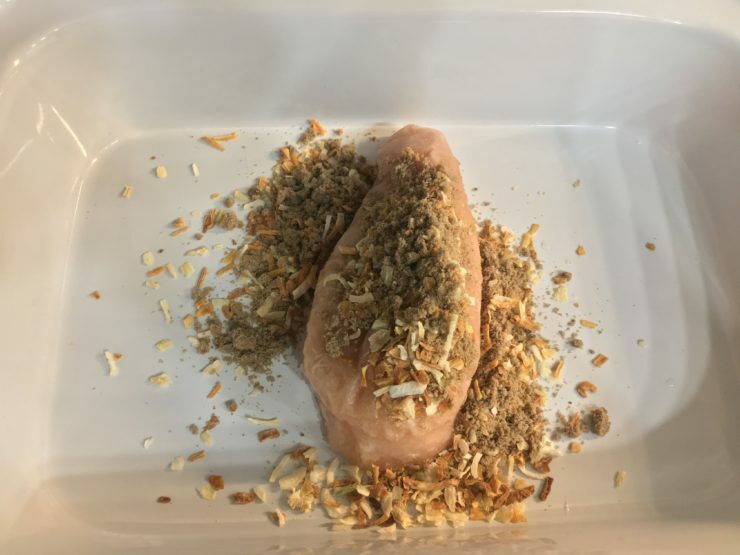 Now tear open that bag of Onion Dip & Soup mix and pour the contents over the chicken breast in the slow cooker. 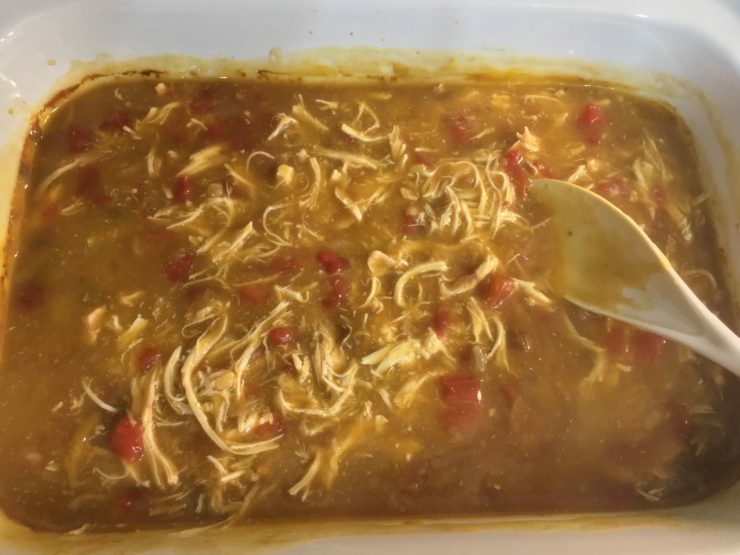 Pop open that can of mild tomatoes with green chilies and pour it, juice and all, over the chicken and onion soup mix in the slow cooker. 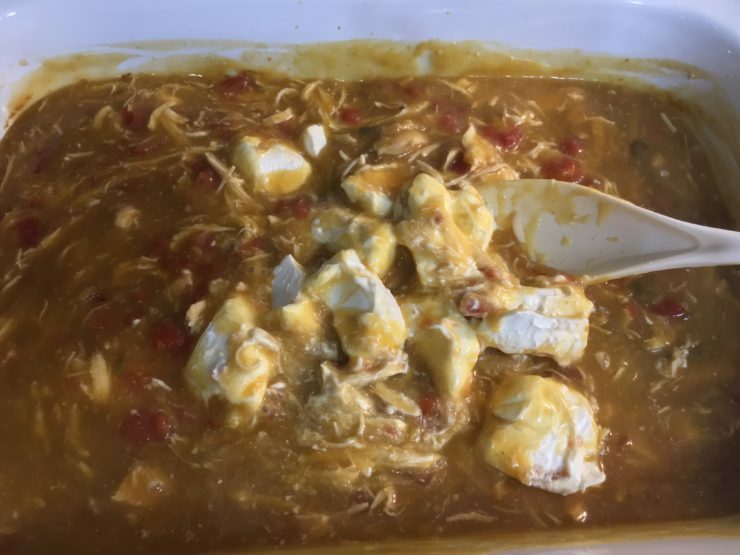 Next we want to pop open the can of Healthy Cream of Chicken Condensed Soup and pour it over the contents in the slow cooker. 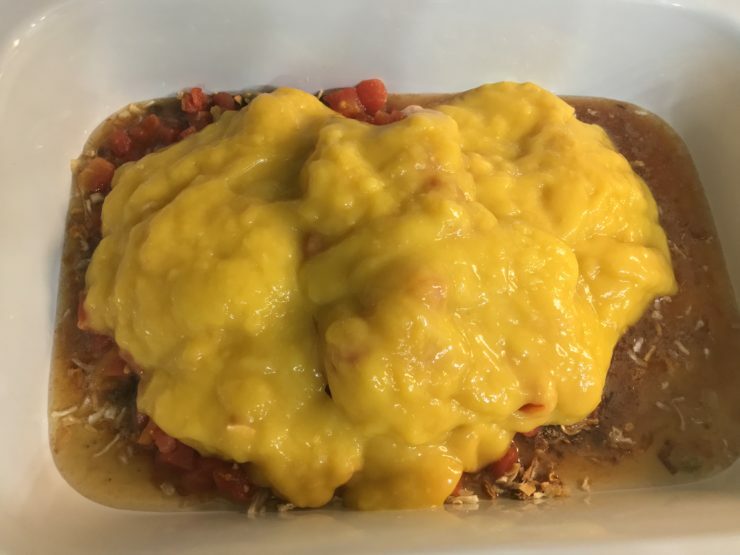 Place the lid on the slow cooker and set this chicken casserole to cook on high for 5 hours or low for 7 hours. Fast forward a few hours. You’re tired from work or just playing with your kids all day and you’re hunger. Good news, this Slow Cooker Creamy Chicken Macaroni Casserole is just about ready to eat! 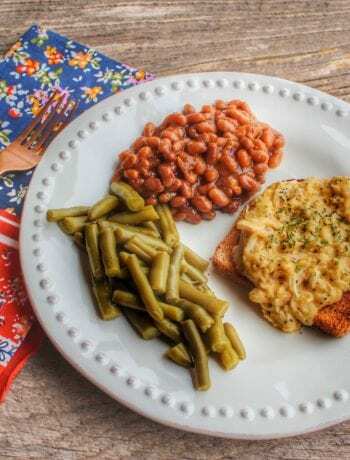 Remove the lid from your slow cooker and inhale the wonderful aroma that is this Slow Cooker Creamy Chicken Macaroni Casserole. 🙂 Don’t turn the slow cooker off though! We want to keep it hot for the next few steps. Grab two forks and shred the chicken in the casserole dish between two forks. Once the chicken is shredded, stir it into the sauce in the slow cooker. Grab your cream cheese, open the packaging and cut it into squares. 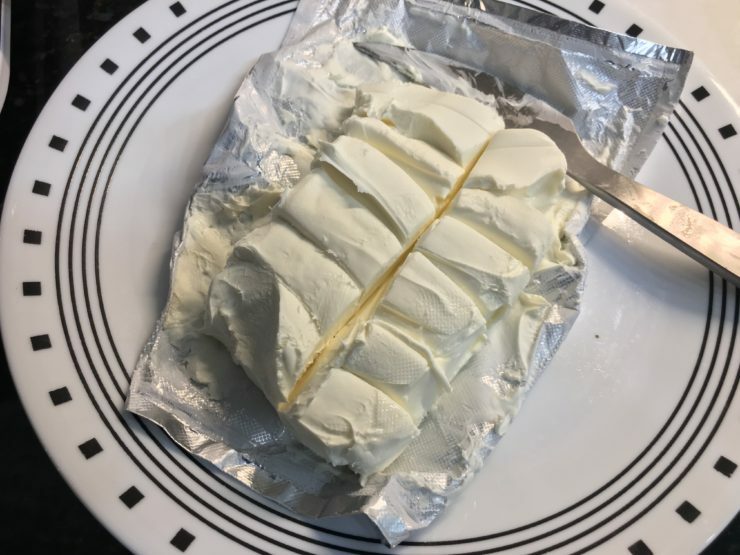 If you had a chance to set your cream cheese out until it warmed to room temperature that’s even better, but if you didn’t have time to do that, don’t worry, it will still melt fine when stirred into the hot ingredients in the slow cooker. Place the cream cheese in the slow cooker and get ready to start stirring. 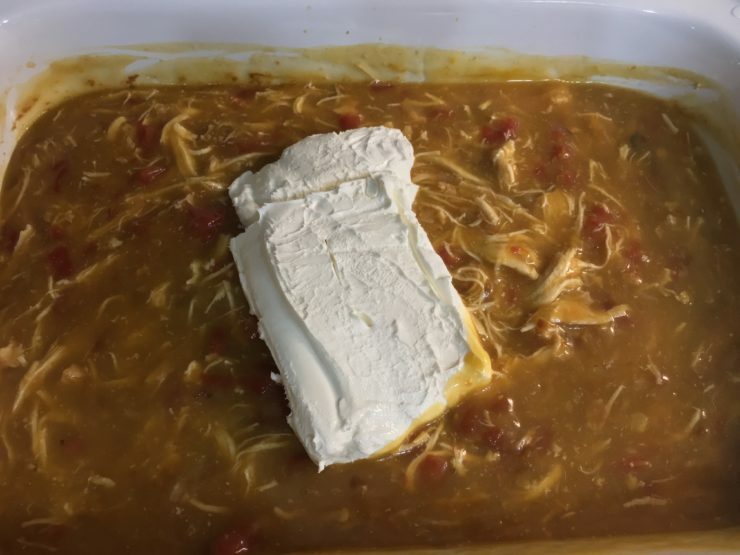 Stir those squares of cream cheese into the chicken and sauce in the slow cooker until it is fully melted and combined with all of the other ingredients. Now is probably a good time to cook up your elbow macaroni noodles. I prefer not to cook my noodles in the slow cooker because they tend to become too soft and mushy. For the perfect, al dente noodle, you need to boil them in a pan on the stove. I just cooked 12oz of elbow macaroni on the stove in a medium sized sauce pan according to the package directions. 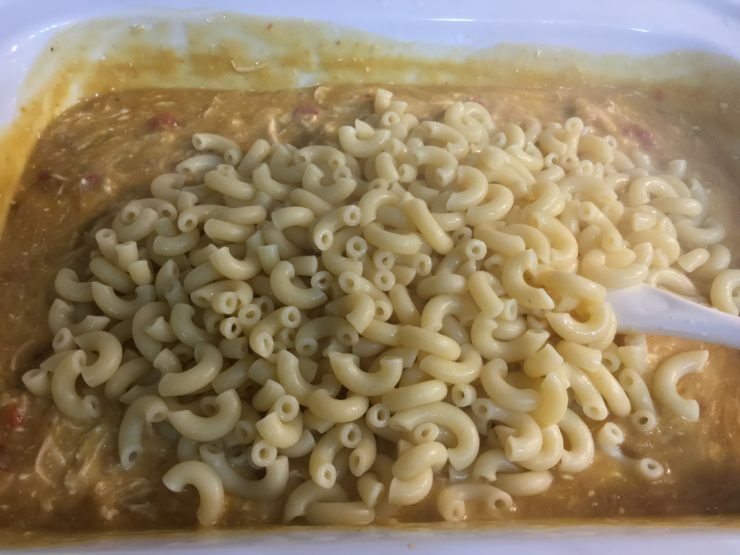 Once the macaroni is cooked and the water is completely drained from the noodles, pour them into the casserole slow cooker. Stir the noodles into the ingredients in the slow cooker and spread the chicken macaroni casserole out evenly in the casserole dish. 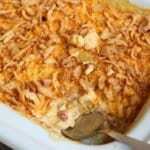 Top the Slow Cooker Creamy Chicken Macaroni Casserole with 1 1/2 cups of shredded cheddar cheese. 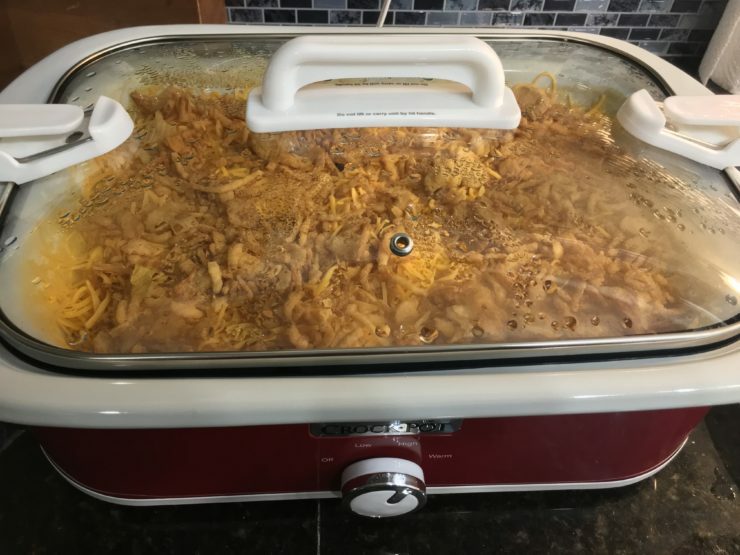 Now top the shredded cheddar cheese with 1 1/2 cups of French fried onions. Place the lid back onto the slow cooker just until the cheese melts. This should take about 10 minutes. 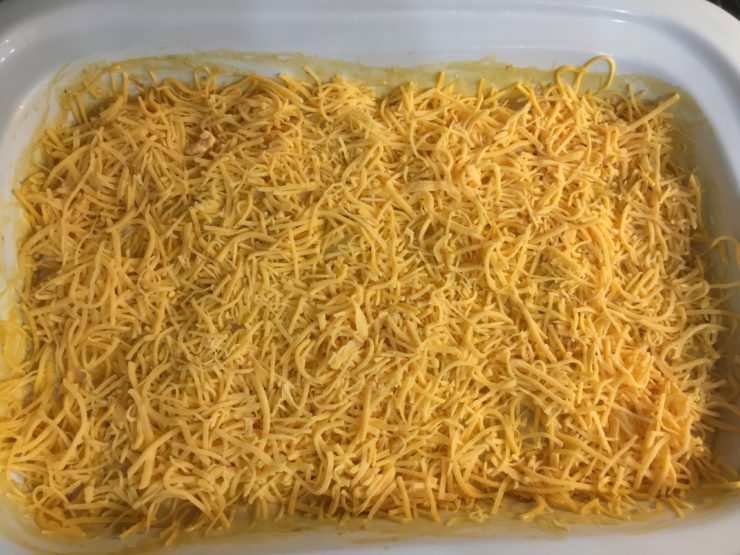 While the cheese melts I like to prepare the side items that I’ll be serving with the meal so go ahead and wash/chop any veggies or heat up any sides that need heated. 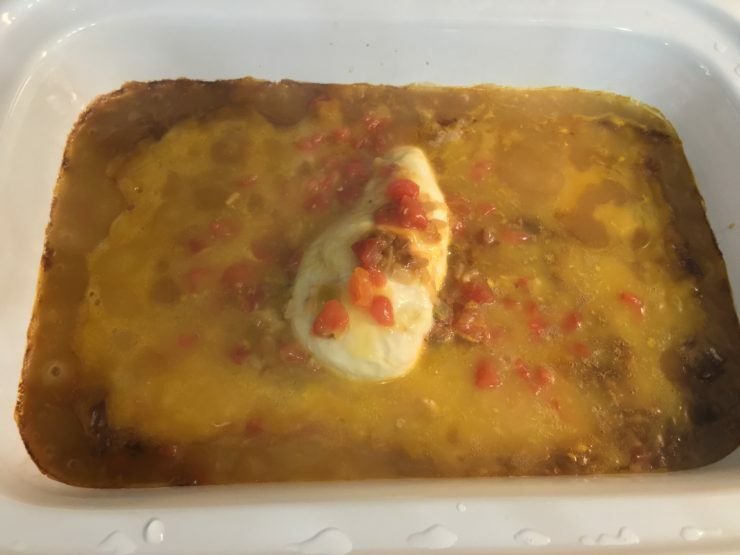 Once the cheese is melted, remove the lid from the slow cooker, turn the heat off, and get ready to dig in! I paired our Slow Cooker Creamy Chicken Macaroni Casserole with small sweet peas with mushrooms and onions and also served up a large, house salad. 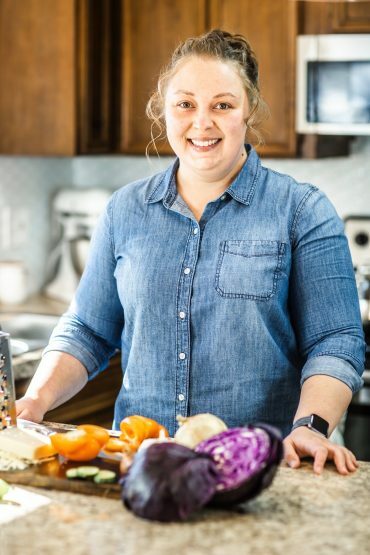 I am so happy that you choose to spend a few minutes in my kitchen today and I sure hope you will come back soon to see what I’m whipping up! 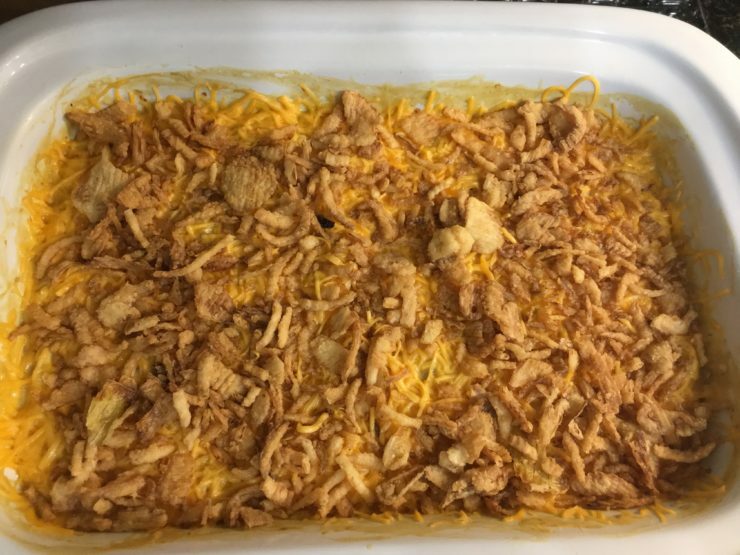 There’s always something delicious going down in The Speedy Spatula kitchen! 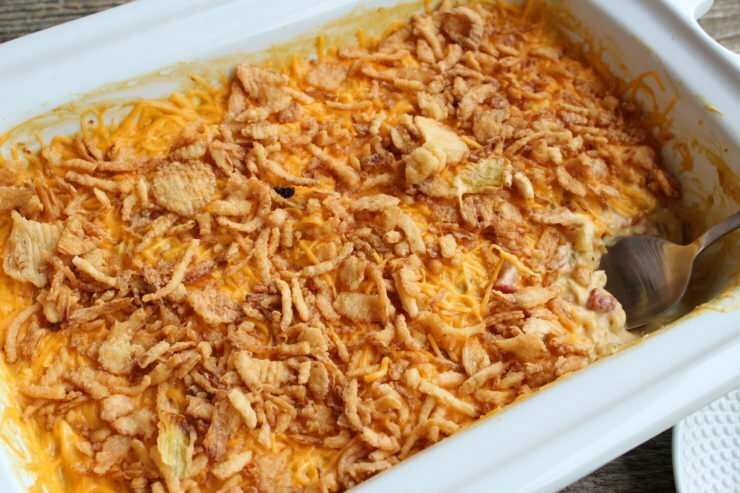 A delicious, ultra creamy casserole that will have the whole family coming back for more! 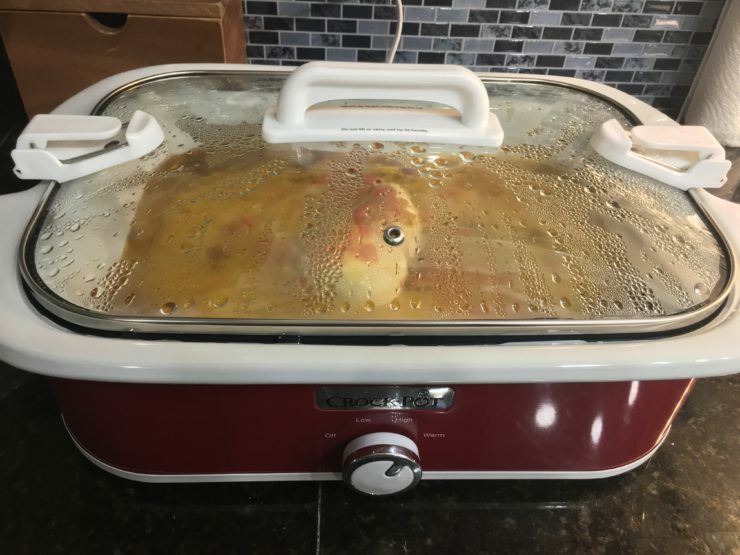 Place the chicken in a casserole (9x13) sized slow cooker or in a 4 quart or larger slow cooker. Add in the mild tomatoes with green chilies (do not drain! ), cream of chicken soup, and the onion soup mix. Place the lid on the slow cooker and cook on high for 5 hours or low 7 hours. 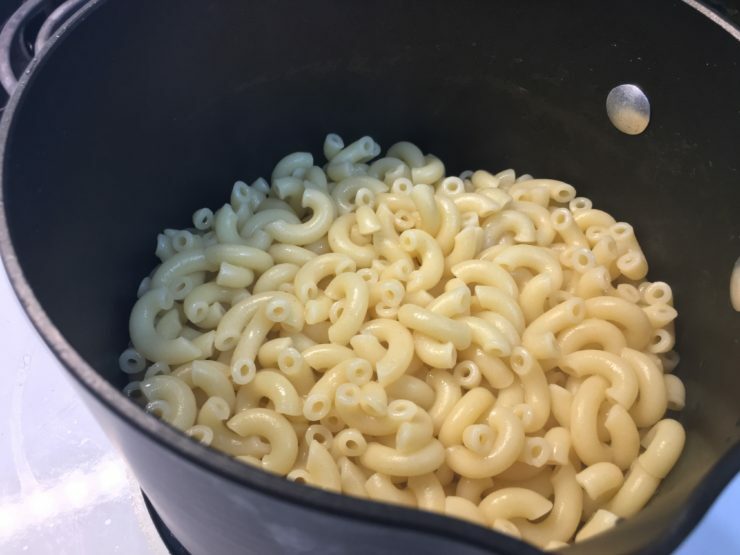 About 15 minutes before the cook time is complete, boil the macaroni noodles on the stove according to package directions and until tender, then drain all water from the noodles. Once the chicken is cooked, shred the chicken and dice the cream cheese. Add the cream cheese in with the shredded chicken and sauce and stir until well combined. Stir the cooked macaroni in to the ingredients in the slow cooker until well combined. 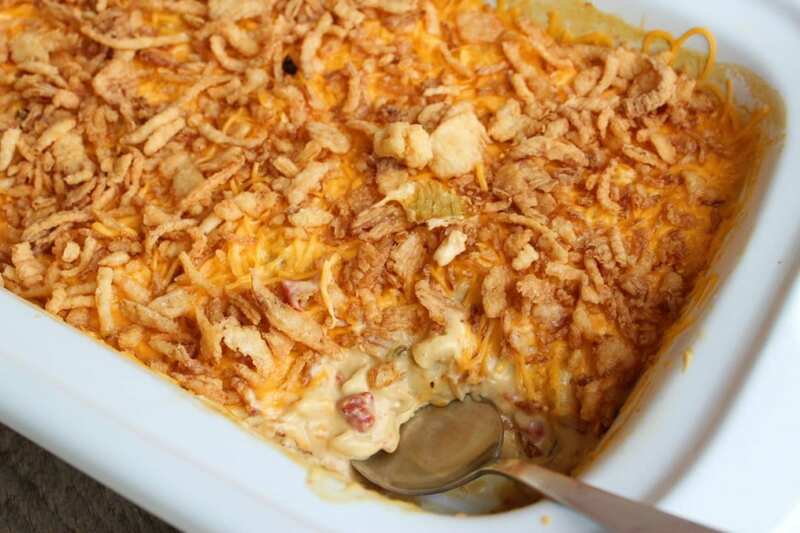 Spread the casserole out evenly in the slow cooker and top with shredded cheddar cheese and French Fried onions. 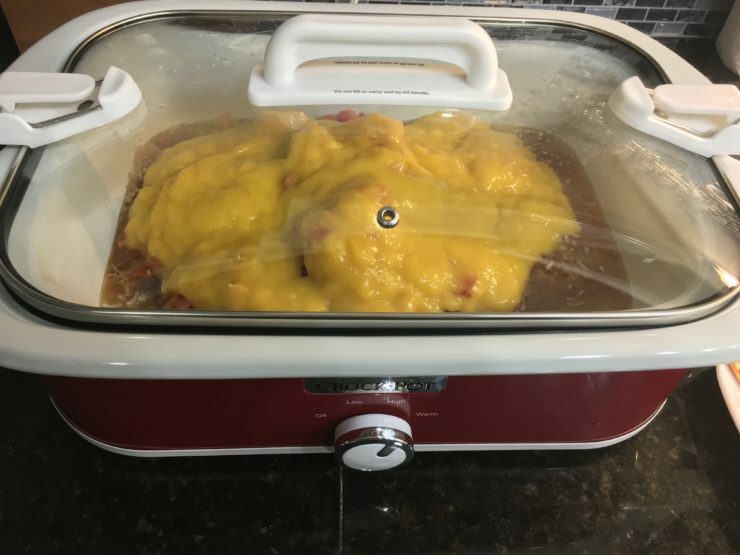 Place the lid on the slow cooker and cook on high until the cheese is melted. Remove the lid and serve! 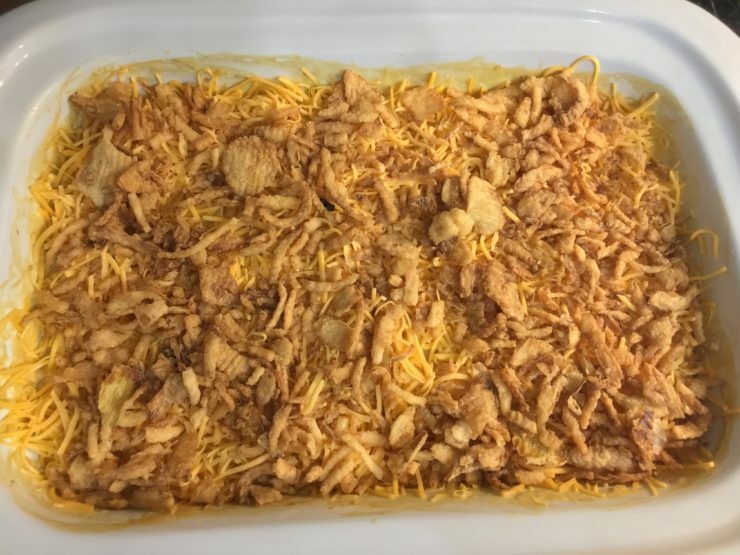 This casserole pairs beautifully with a wide variety of side dishes including: steamed broccoli, green beans, green peas, a tossed house salad, steamed carrots, whole kernel corn, steamed cauliflower, and pickled beats. This looks so simple and so delicious. Thanks for sharing at the What’s for Dinner party – enjoy the rest of your week! We love it! Pure comfort food!